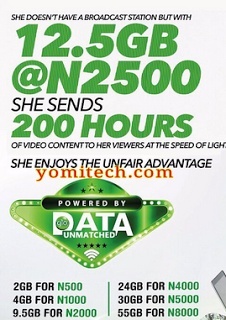 Just about a week after introducing Unfair Advantage, Free Youtube and iFlix Video Streaming plans, Glo which is also known as the grandmaster of data plan in Nigeria has just added one more to it's list of data bundle mainly for the heavy users. The new Glo 180GB data plan for N20,000 will really come in very handy for heavy internet users like heavy download users, cyber cafe operators, business centers, schools, hospitals, offices, companies, etc. "Heavy user? We've got an unbeatable plan for you. It's 180GB of data for ₦20000 only with the new #GloDataUnmatched plan #GloUnfairAdvantageDial *777#"
Glo is no doubt the best option when it comes to affordable data plan in Nigeria at the moment, but I think the only thing they really need to work on now is their very poor network reception in many parts of the country. That's it guys, let me know what you think in the comment section below.